Scythe presents the Big Shuriken 2, a new low-profile cooler with a nickel-plated copper base, five copper heatpipes, aluminium fins and a 120mm Slip Stream Slim PWM fan that delivers 12.13 - 45.47CFM at a noise level of 9.32 - 33.67dBA. The cooler measures 125 x 135 x 58 mm, it weighs 410g and is compatible with Intel LGA775/1155/1156/1366 and AMD Socket AM2/AM3/FM1 processors. The Scythe Shuriken 2 cooler will retail for around 30EUR (excl. VAT). 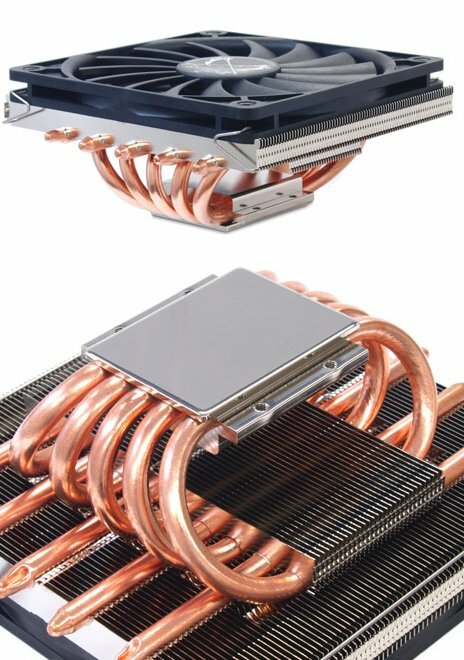 Japanese cooling expert Scythe announces the successor of Big Shuriken CPU Cooler. Big Shuriken 2 had to undergo further development on the heatsink and axial-fan side to provide better even performance and compatibility. Applied improvements of heatsink are not obvious at first sight because main heatsink structure was inherited from Big Shuriken (1) CPU Cooler. Total amount of copper-heatpipes was increases from four to five pieces. Curved heatpipes are connecting the nickel-plated copper-base with the two upper layers of aluminum fins. Big Shuriken (1) was equipped with a solid heatsink on top of the copper-base which has been removed in the new version. Consequently socket mounting is no longer achieved by using VTMS mounting mechanism but the F.M.S.B. 4 (Flip Mount Super Back-Plate 4) using screws and backlpate. Socket compatibility list has been kept long as usual, including latest Intel socket LGA1155, LGA1156, T / LGA775 and LGA1366 as well as AMD socket AM2, AM2+, AM3, AM3+ and FM1. New Version is furthermore equipped with a Slip Stream Slim 120 PWM axial-fan with a thickness of only 12 mm allowing the total height of Big Shuriken 2 being only 58 mm. Supplied 120 mm fan supports the PWM feature offering variable fan control between 500 and 2.000 rpm. Depending on fan speed and requirements the supplied fan is able to create airflow from 21 to 78 m³/h respectively from 12,13 to 45,47 CFM.